Ah, I've finally started answering your comments. But I just managed the Strudel and the Blintzes posts. I don't know why I thought I'd go through them faster. Clearly reading, thinking, and replying take time! Yes, I know the image title isn't a word. But since I returned, I've gone mad from meeting random relatives and family friends. Why? Because no less than ten people have told me, "mukhang tumaba ka!" (Translation: It looks like you got fatter! Unsaid: ... Porky!) And while just the plain words written out just seem baseline-offensive, the thing that drives me crazy is the way they say it. With a giant smile on their faces! Like somehow they think it's a good thing to tell someone that they have chubbed up. Twisted. Without speculating too much, I think there may be a cultural/ generational difference going on here. And not in the way that the Romans thought that overweight women were attractive or something. You see, if we're just talking about my own circle of friends, the only time we'd talk about it is (1) asking point-blank ("Do I look fatter? "), in which case the answer is always either "No!" or "Not by much, don't worry!" or (2) a male friend poking fun at another guy. But it's always undesirable, unless we are talking about my friends who have difficulty gaining weight, curse them. With older folks (one full generation or more up, though a cousin from my generation said the same), it's possible that they do equate gaining weight with a general state of happiness ("It looks like the States agrees with you! "), sometimes health. The mere fact that you gained weight can go either way when they're talking about you behind your back ("He gained weight, but it looks better on him"). But among my peers, unless you're skin-and-bones, the connotation is that you've let yourself go or something. I wonder which generation has it better. Truth? I'm a lot hard on myself for my appearance (without crossing the unhealthy body image line, I think-- then I wouldn't be baking), but I don't think I look substantially different. Based on Jen's kitchen feature with a picture of me, is that someone you'd call a chub? Definitely I gained only 3-5 pounds, which is not bad considering I did not go to the gym for 3 months (except for the Wii fit every day for 3 weeks), sometimes ate American-sized portions (regularly I eat palm-sized portions), gorged on desserts when the opportunities presented themselves (I was in MANHATTAN! Give me a break! ), and stayed in most of the time due to the insane temperatures. ... But yeah, I did get heavier. But is that any reason to tell it to my face? If I was feeling grumpy, what should I have said? Okay, I promise this is the last time in a while I'll be talking about weight. I just had to vent while it was still fresh. 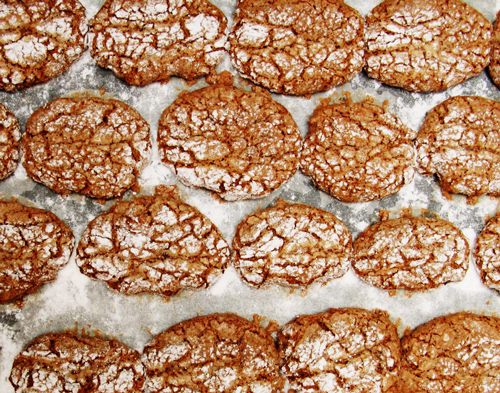 Today we have a recipe I made a while back-- Dan Lepard's Chocolate Amaretti. They are extremely easy to make (although they do need overnight). No butter in these-- they rely on ground almounds for moistness. They were gone nearly as I produced each tray from the oven! Not an indulgence, but if you need a satisfying hit of chocolate, these will do in a pinch. They were also convenient as I had a stock of ground almonds; I made the recipe to use up leftover egg whites, and they're a good way to go if you don't want to fuss with macarons. 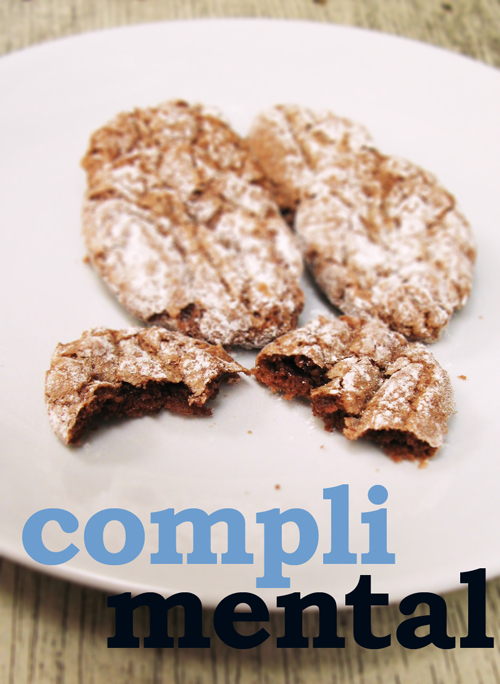 The recipe is here, with a step-by-step by the Man himself here. His pictures are much better than mine, heh.